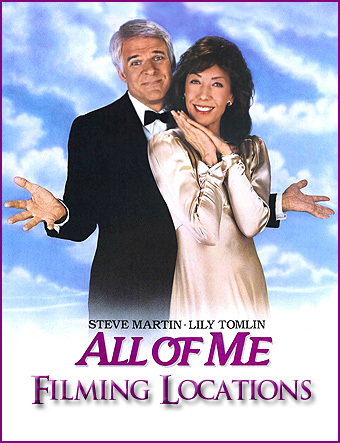 Steve Martin/Lily Tomlin comedy, "All of Me", was filmed. car and listens to a blind man play the saxophone on a street corner. who tries to talk Roger into joining a jazz band full-time. in downtown Los Angeles. In the background, you can see the giant "Peace on Earth"
sculpture and fountains that stand in front of the center's Dorothy Chandler Pavilion. on the west side of the center, at 180 N. Hope Street, near the flag poles. 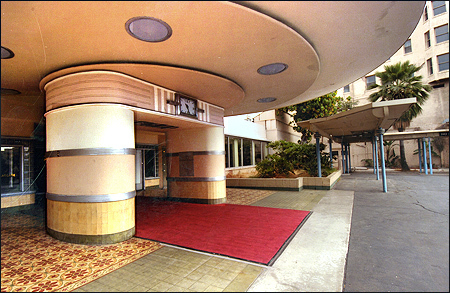 Here is a matching Bing StreetSide View of the plaza. a wealthy woman who has been plagued throughout her life with ill health. of 'Terry', the daughter of her stable keeper. 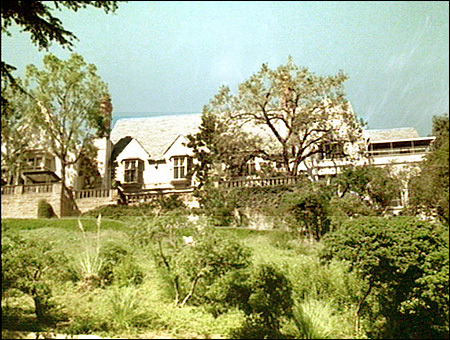 at 905 Loma Vista Drive, in Beverly Hills. movies & TV shows, from "Star Trek 2" to "The Bodyguard". On TV, it was Rory's school on "The Gilmore Girls". and with 55 rooms, it was the largest home ever built in Beverly Hills. It has hosted at least two Presidential visits (Barrack Obama & Billl Clinton). And as an extra, its grounds are open free to the public - if you want to visit. Here is a Google StreetView of the Greystone's gates. while Prahka Lasa waits to catch her soul in a bowl when she passes. the spirit of Edwina Cutwater - much to the displeasure of both parties. only control the left side... which leads to struggle & confusion. 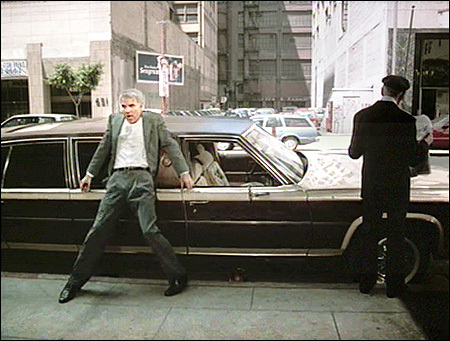 in downtown Los Angeles (now called SB Lofts). the east side of Spring street, just north of 6th Street. 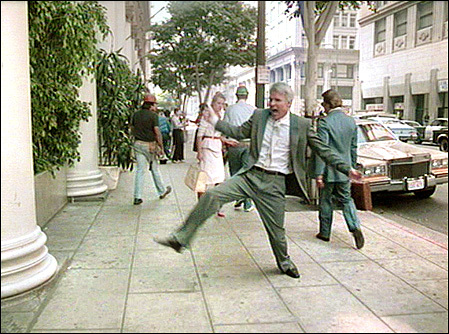 "Spider-Man 2", "The Mask", "Ghost" and "L.A. Story". Here is a Google StreetView of that entrance. 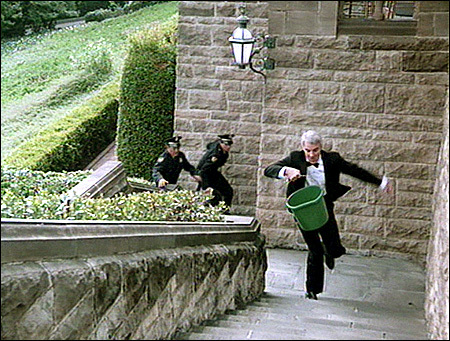 (which are seen in the film when bowl falls from the window). controlling half of his body - resulting in a jerky ride of stops & starts. between 1st & 2nd Street (just south of 1st), in downtown Los Angeles. Los Angeles Music Center. The empty lot to the left is where Walt Disney Hall is today. Here is a Google StreetView of the street. on Hope Street, on the plaza's west side. Here is a Bing StreetSide view of the same statue. 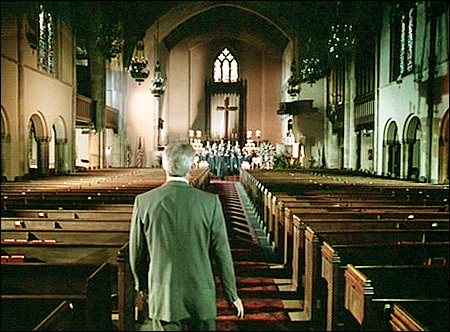 church empty of mourners, except for the poor preacher. 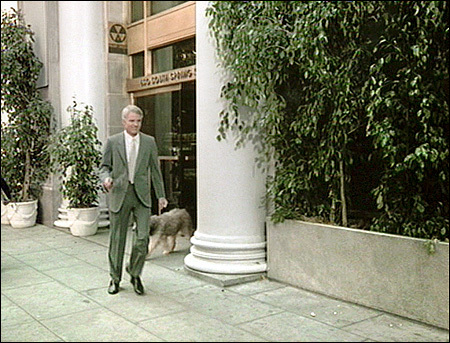 at 4350 Wilshire Blvd, in Los Angeles. That's south of Hancock Park, at the southwest corner of Wilshire & Plymouth Blvds. 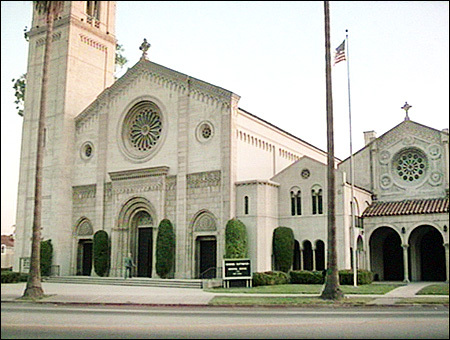 Here is a Google StreetView of the church. 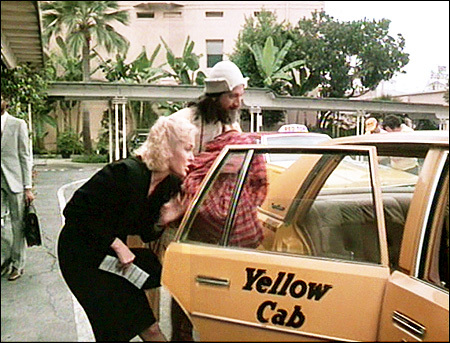 1:00:24: 'Prahka Lasa' & 'Terry' run out of a hotel and she puts him in a cab. 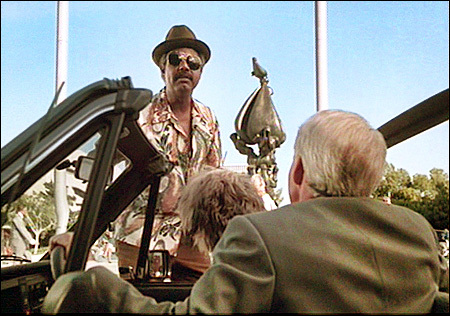 guru out of town, so he can't fix the accidental body-switch. 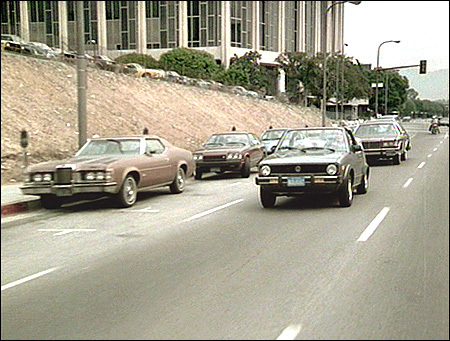 which was at 3400 Wilshire Blvd, just west of downtown Los Angeles. s been the scene of countless movies. Alas, the Ambassador Hotel was torn down, and a school was built on the land. (RFK Community Schools / Los Angeles High School for the Arts). Here is a Google StreetView of the school now at that address. he has hired a Dixieland jazz band to liven things up. scores of Hollywood stars, from Rudolph Valentino to Don Adams. 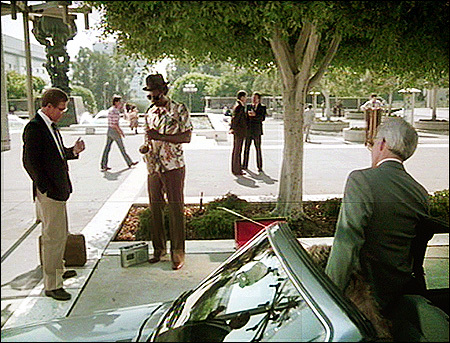 It's located right next to (north of) Paramount Studios. 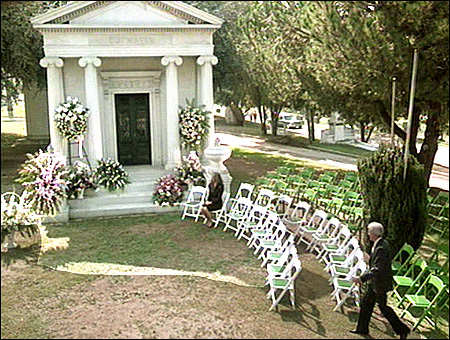 At the time, it was still known as Hollywood Memorial Cemetery. which features both old-style, standing monuments and a lake. 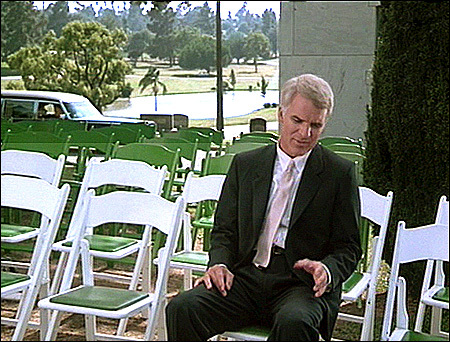 and try to track down that small mausoleum. Here is a Google StreetView of the park gates. 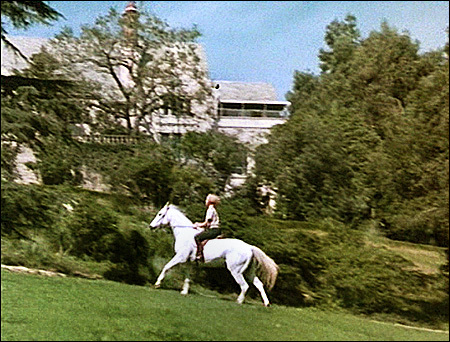 1:10:46: We see Terry horseback riding, after she has double-crossed Edwina. 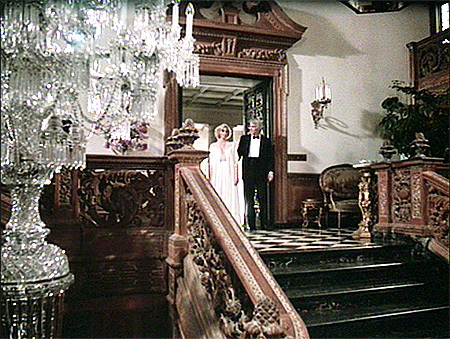 and the final 20 minutes of the movie, both inside & outside the mansion. The photos on this page are stills from "All of Me"
(which you can buy by clicking here) and are copyright Universal.